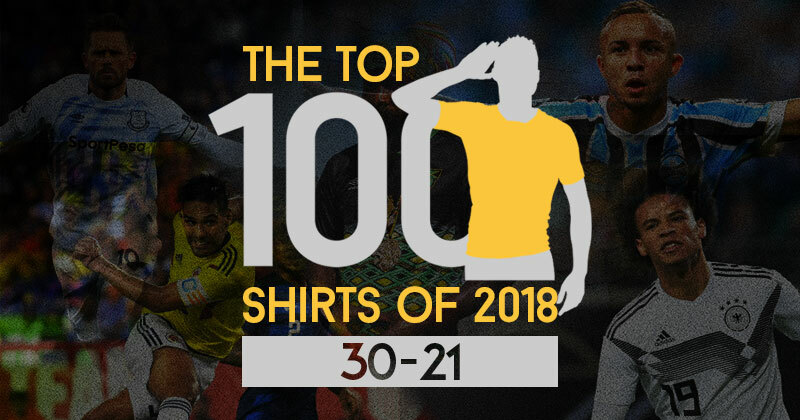 As we begin to draw Top 100 Shirts to a close, it’s a good time to look back on some of the shirt trends of the past year. To start with, any conversation about 2018 has to start and end with the World Cup. The football was surprisingly captivating and the shirts were perhaps the most talked about of any World Cup, ever. This list has already revealed one of the iconic shirts this summer in Peru home, but in the next 10 on the list we highlight no less than 3 other shirts seen in Russia. It’s been an important year for highlighting just how much of an impact considered design can have, and we are all better for it. Then moving from the World Cup for a minute, I would argue that 2 manufacturers in particular have achieved great things this year. Firstly, Umbro have stolen the show by creating a series of amazing shirts across the leagues. Best of all they’ve done it in a range of ways, their signature piece has been some their beautiful double diamond cuff designs, but they’re also created some great looks in other ways. They’re far from being a one-trick pony, as their shirts in the next 10 will show. Secondly, Nike have surprised many people by being far more creative than their reputation allows. Some of the best designs this year have come out of the Nike stable, and a couple of the best can be found here. Another unique effort from Umbro who have all in all had a brilliant year. The fading on this shirt of the blue lines is what really makes it for me, giving it a definite 90s feel and thus places it in a category of its own. Apparently the inspiration for the rather unique design featured on this edgy piece comes from Rupert's tower (or Everton Lock-Up), the building famously featured on the Toffees crest. 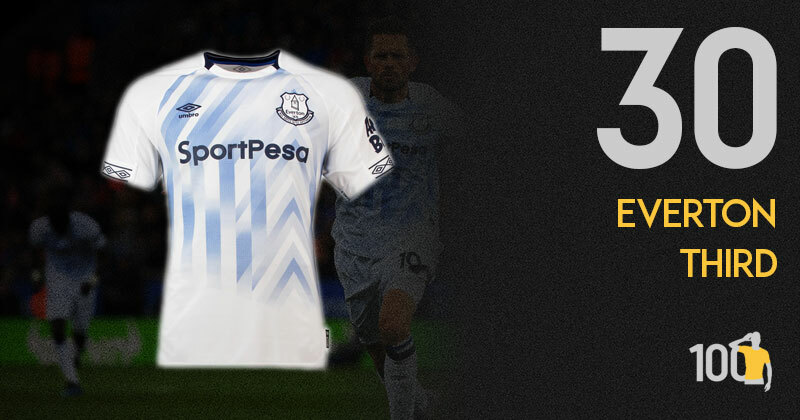 Inspired by Prince Rupert’s Tower, Everton’s third kit is like no other. It is truly unique and one that we probably won’t see again anytime soon. It’s nice, but I feel as though it’s a one off. Outside of the graphic, it’s a fairly simple kit. As per usual, still love the sleeve ends but the one grudge I have with all Everton kits from 2018 is the use of the WORST sleeve sponsor ever. Looks terrible. 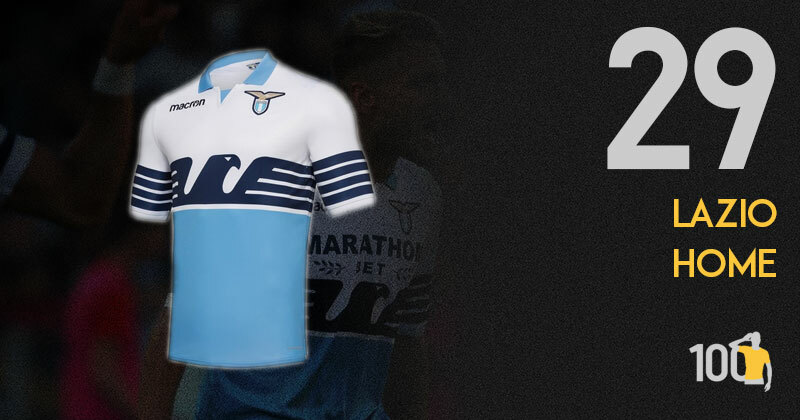 It’s hard for me to not insert my bias as a Lazio fan, but this kit is the perfect home shirt for Lazio. The dark blue eagle running across the white half of the shirt is intimidating and epic, and I love the way the sky blue is below it. The collar is simple but does nothing wrong, using the same shade of sky blue. Used most recently back in 2015, I’m over the moon that it’s made its comeback. Everything about this shirt is stunning. The sky blue and white mix is a masterclass of colour juxtaposition, whilst the eagle design is beautiful without looking over the top. A slight remake of the famous ‘flag shirt’ from 2015 but this time with a gorgeous knitted polo collar. I think Macron are my favourite shirt producers of the year. I love a kit that pays tribute to an all time classic but tweaks it ever so slightly. 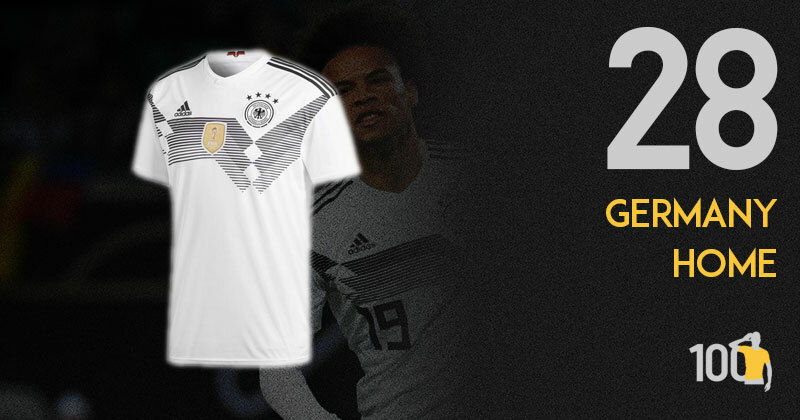 Nothing in my eyes will ever beat the Germany 88-92 kit, and at last they have given a reworking a go and not ruined the original. By reversing the direction of the three-strip chest design (that was simply awe-inspiring back in the day) and rendering it in grey and black adidas have done well to change the original sufficiently for this to stand up on its own. The thing that ruined it for me was the hulking great unnecessary Fifa badge. Now that’s gone it is nigh on perfect. What could have been hey? There are two sad facts about this shirt. The first is that we had to see it at the World Cup with that hideous FIFA badge. Secondly, it was buried on the worst German team in history. They did anything but justice to a design which I thought was one of the best callback shirts in a summer for callback shirts. This is a fantastic example of what can be achieved with fresh eyes and daring pencils. Sadly there was nothing fresh or daring about the team wearing it though. 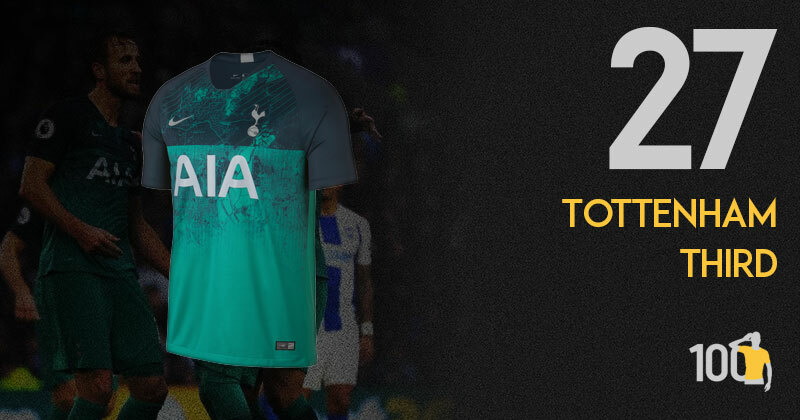 As a Spurs fan and someone who grew up in and around Tottenham, it’s great to see this shirt on the list. However, this was not love at first sight. Far from it. My initial reactions were confusion and disappointment. However, the more I see it, the more I love it. The shirt uses design features taken from the 1986 Hummel home shirt (my first and favourite ever shirt). And the green comes from the logo of an old brewery that owned part of the land where the new stadium has been built. So… my hometown, my favourite ever Spurs shirt and a brewery… this shirt is a winner all day long. Nike’s style with the third kits this season was to focus on the city of the club, and by using a stand out teal green North London as the main feature against a dark green was a wonderful idea. It suits the club’s identity perfectly, feels incredibly memorable and is yet another example of that city styled template working perfectly. Being honest if I was the sole compiler of this list this very shirt would take pride of place at number 1 spot. Making a switch from adidas to Kappa this season, Real Betis have come in hard with some beautiful kits. Inspired by the shape of the club's crest, the gradient design on this shirt is striking and achieves what is (in my opinion) an impossible task: making a dark green shirt look beautiful. There is more than meets the eye with this stunning Real Betis away shirt. 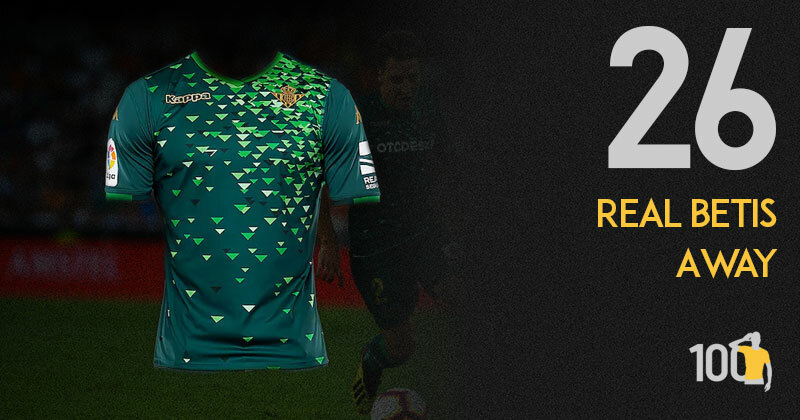 The shirt uses the traditional dark green and it contrasts with gold logos and club badge (this being a nod to a golden period in the club’s history when they first wore Kappa kits). However, it’s the 400 triangles on the front the shirt that really catch our eye. What looks like a computer graphic gone wrong, actually represents the 400 fan clubs around the world. And what makes this really special, is that each fan club can access a virtual shirt and choose a triangle to represent them. Just look at the cuffs on this shirt man. Simply brilliant. Jamaica have had some excellent shirts (France 1998 anyone?) that are based on that gorgeous flag of theirs but this is just the best they have ever managed. The beautiful simplicity of the top third of the shirt (lovely single colour green collar on black base shirt) is then wonderfully challenged by a stunning complex pattern of interlocking diamonds that fades towards the top. This is an all time classic and is top five material in my opinion. I haven’t seen Jamaica kits this good since the gorgeous Kappa ones from 1998. 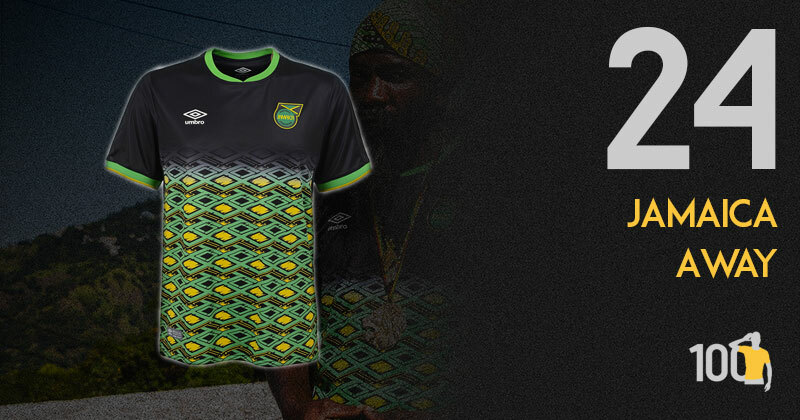 Umbro have designed an eye-catching shirt inspired by Jamaican culture, its energy and the their colours. This is all mixed with the iconic Umbro diamond to create a vibrant graphic which, as is the trend this year, fades away as it reaches the top of the shirt. Umbro complete the look with tapering along the sleeve featuring the Umbro diamond. This is a kit that will catch people’s attention and for all the right reasons. This is one of several Nike third kits that use the club’s location as inspiration and I absolutely love it! The Bosporus strait, which divides Istanbul’s European and Asian sides, and the surrounding neighbourhoods are depicted in a vibrant design. It almost resembles a lightning bolt and it certainly does feel like there is an energy running through the shirt. A shirt which is identifiable to the club’s fans, and designed in creative and eye-catching way will always be a winner in my eyes. What a stunner this is. A nod to Colombia’s past from a time where players like El Pibe donned the shirt, adidas have done today’s Colombia justice as this kit will also be talked about for a long time. 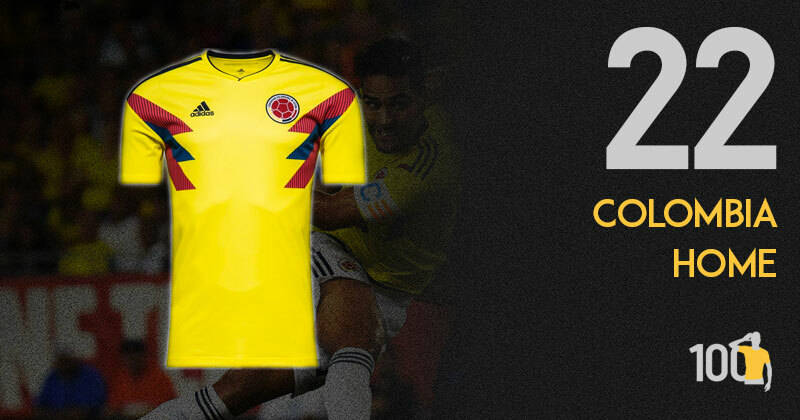 Bold yellow and navy accents really make sure that everything about this kit screams Colombia. Love it. 1990 was a wonderful time for adidas international kits and, like Germany Home, they’ve done a splendid job of paying tribute to a classic Colombia kit used at Italia 90. The collar is clean, simple and an adidas classic. The main body of the shirt a perfect yellow. Then you have the reworked three-stripe design from each armpit. Very close to the original so loses points for originality, but my word is it pretty. I have to admit that there has never been an Argentina away kit that I haven’t liked. Factor in adidas and they’re always great kits. The collar is just perfect. That dark blue is just great and with the three-stripe design in the flag’s colours it all comes together. I have to admit it helps when you have a badge like that. Lovely stuff and the kit could only belong to one nation. 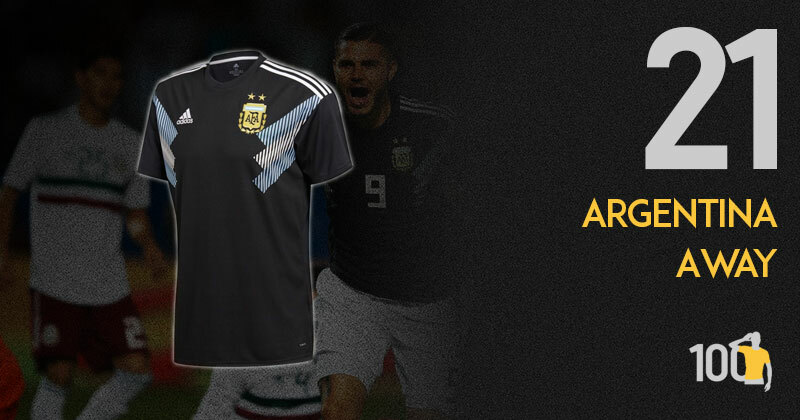 Inspired by Argentina’s 93 kits this years kits are nothing short of stunning. Although the away kit is a bit of a cookie cutter, I still love it. With shapes taking over the chest representing the flag, it really is a nice touch. One of the most fitting things about this kit is how well the front & back numbers work with it. After months of arguing, we've finally come up with a list of the best shirts this year.